Because he had no place he could stay in without getting tired of it and because there was nowhere to go but everywhere, keep rolling under the stars. 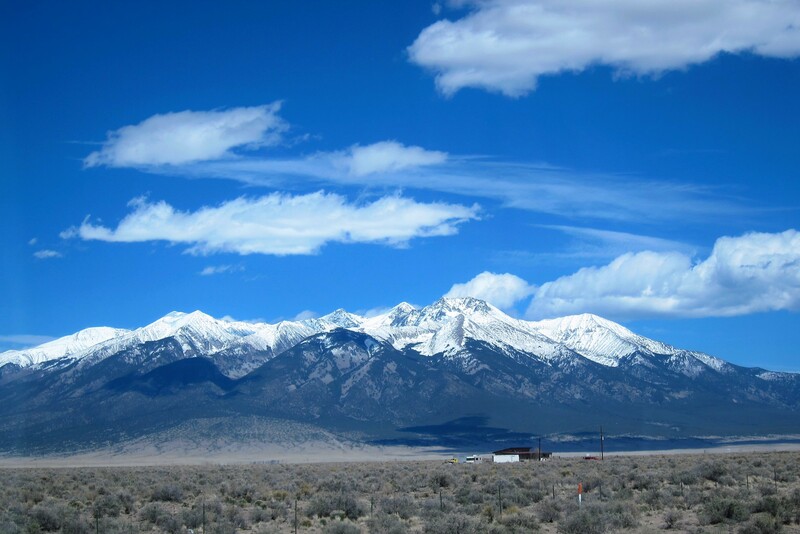 Sunday, April 24, 2016: Before Kit and I head out of Durango, Colorado a few more comments about this interesting southwestern mountain town. 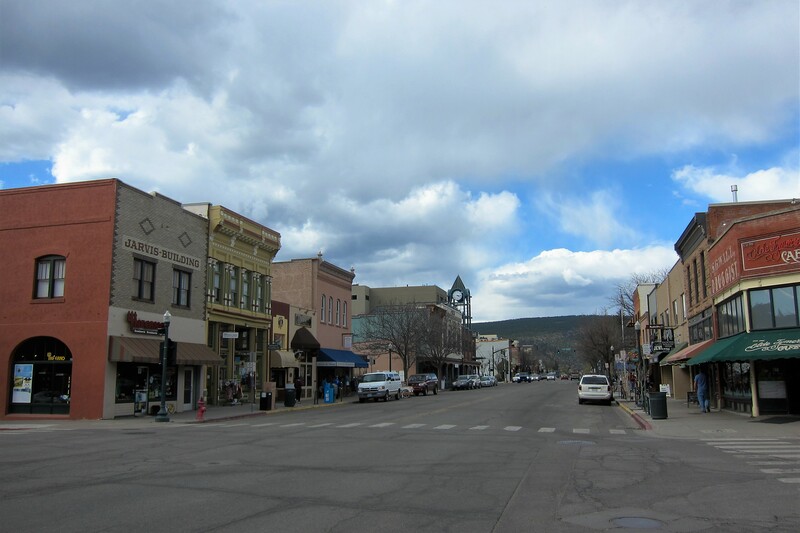 In addition to the very enjoyable ride on the Durango and Silverton Railway, we spent considerable time walking about the very pedestrian friendly downtown area. 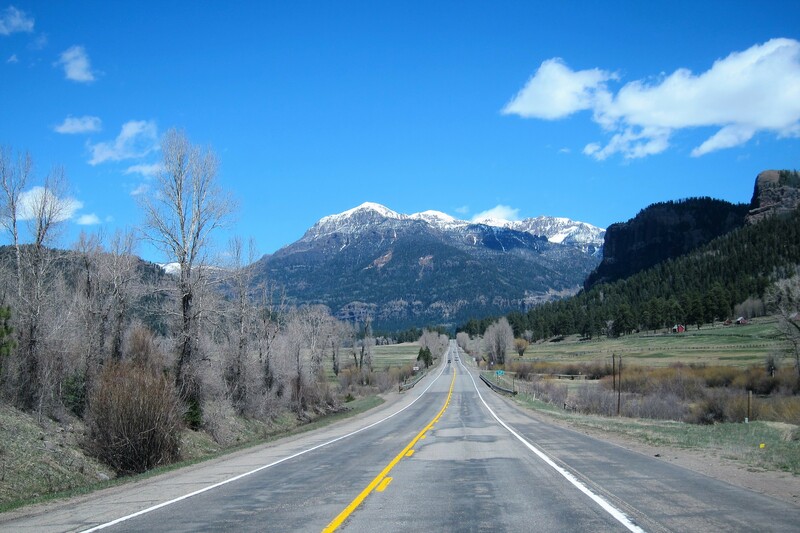 It contains the usual mix of restaurants, taverns, gift shops and outdoor equipment outfitters that most Southern Colorado towns feature. 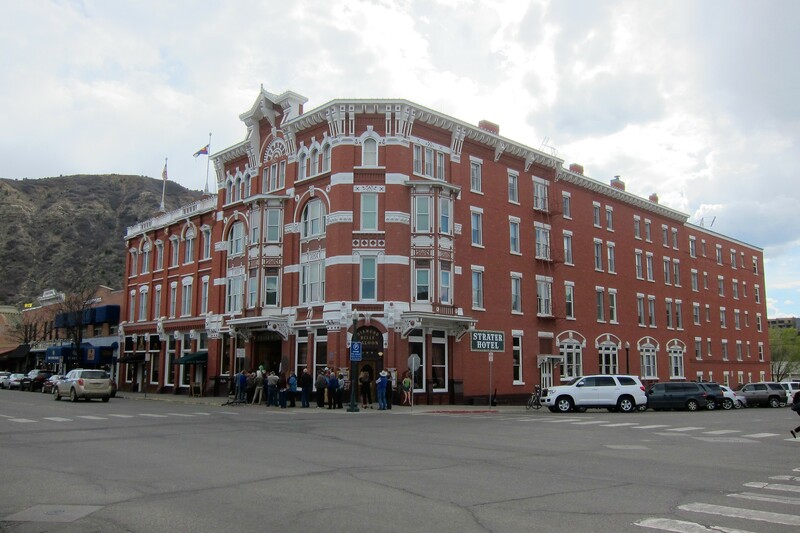 The anchor of downtown Durango is the Strater Hotel. Built in 1887 by Henry Strater, with financial help from his wealthy parents, the Strater was designed to house the inrush of investors and prospectors during the silver and gold mining boom. Upon completion, Henry decided to lease the hotel to an attorney from back east in order to better concentrate on his pharmacy business. Unfortunately, Henry failed to exclude a portion of the prime ground floor retail space for his shop and the new manager priced the rent so high that Henry couldn’t afford to run his business out of his own building! A frequent guest of note at the Strater was the author Louis L’Amour who wrote many of his western novels while staying at the hotel. In addition, a number of movie stars and production folks would stay at the Strater during filming of the many movies that were set in the area. So, today Kit and I hit the road! Getting underway at 0950 we headed east on US-60 under cool and sunny skies as we climbed into the Southern Rocky Mountains. Topping out at 10,782 feet we threaded our way through the famed Wolf Creek Pass before starting to lose altitude. 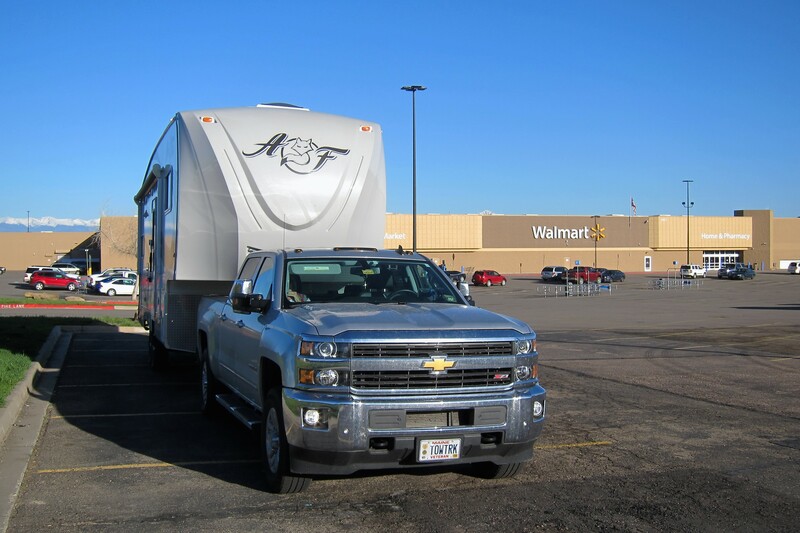 By 1530 we intersected I-25 which took us south toward the town of Trinidad, Colorado and our stop for the evening…Camp Walmart. As Kit set about to restock our larder, I secured permission from the very accommodating manager to remain in the parking lot overnight then did some shopping of my own for truck related items. Most Walmart’s are pretty well standardized as to product mix and product placement…this one was rather unique however. Near the front of the store was a rather robust variety of snack foods! I wondered why until I walked back to the camper and glanced across the road. 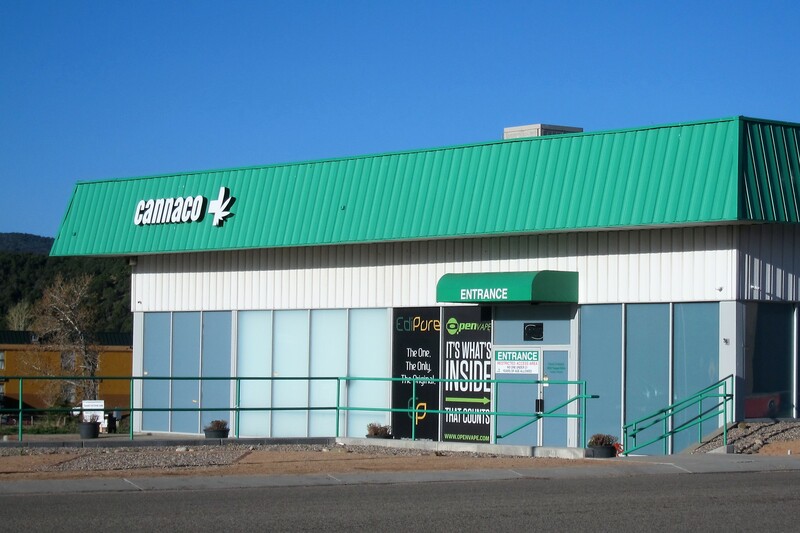 Yep right next door was a rather large recreational marijuana joint (pun intended). For the sake of educational enlightenment, I decided to walk in the establishment and take a look around. There were signs everywhere prohibiting photography, so I’ll try to describe the interior as best I can. The place looked like a mix between a tobacco shop and a bakery with an interesting variety of products priced in accordance with their quality. The shoppers browsing about all looked like average folks, some even dressed in professional business attire. I thought it amusing that the shop offered senior citizen and military discounts however. All in all, it looked completely normal (no pun intended) …but the place made me feel kind of uncomfortable. Must have been all those years of holding a high level security clearance and undergoing all those random drug tests! Kit and I met in our camper and while discussing what to have for dinner, I noticed a long line of cars queued up in the drive through at the Chick-fil-A just down the hill…so since we had never experienced food from that chain, I walked down to fetch dinner. The meal was actually very good! 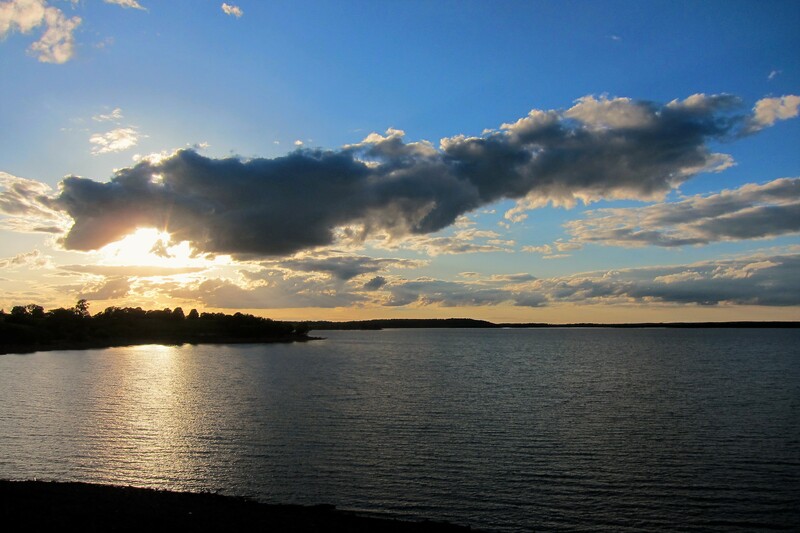 Being that we were dry camping…when the sunset, so did we! Goodnight! Monday, April 25, 2016: On the road at 0730 after a very quiet and peaceful night for a Walmart, we jumped back on I-25 until intersecting US-160 which we took toward the east. 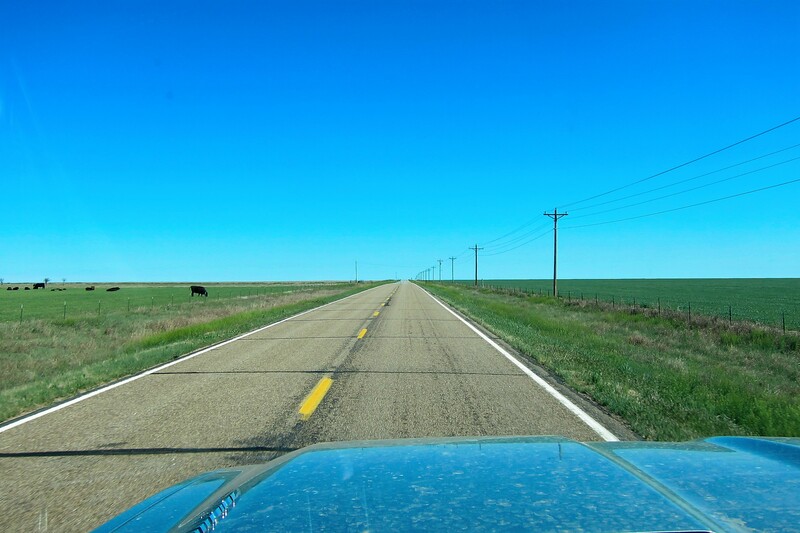 We realized this was prairie country as we passed a sign informing us we were entering the Comanche National Grasslands. The country’s National Grassland’s are under management of the USDA Forest Service…there are twenty designated units located primarily in the central part of the United States. Established as a reaction to the devastation of the 1930’s Dust Bowl (note the spelling, Chris T.) when early farmers drove off the Bison and began using unsustainable practices causing the thin strip of fertile soil to blow away which rendered the land barren. Once the grasslands had recovered, the US Forest Service allowed for controlled grazing to replicate the environmental balance once maintained by the Bison. Since we left so early this morning Kit and I were getting a bit hungry. 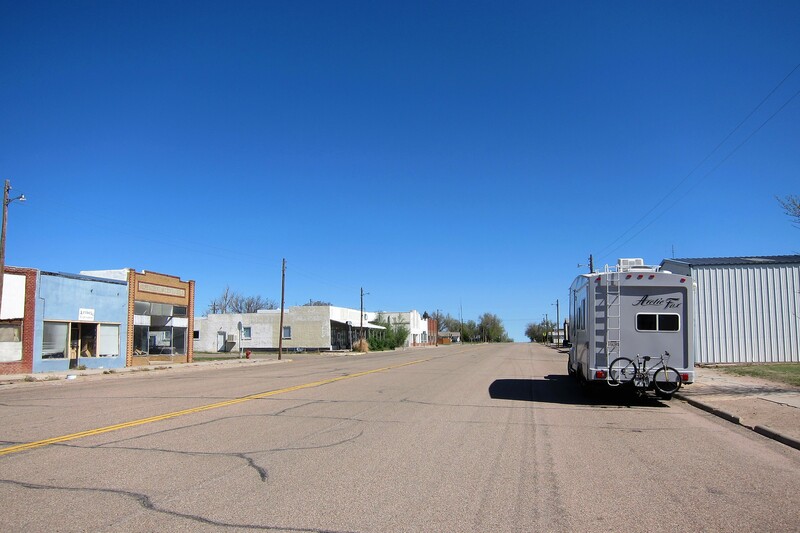 So at around 1000 we decided to stop in the small Colorado town of Pritchett, population 140. A rather forlorn looking place, the only thing still in business was the US Post Office so we made breakfast in the camper and ate as we watched the tumbleweeds tumble down the main drag. 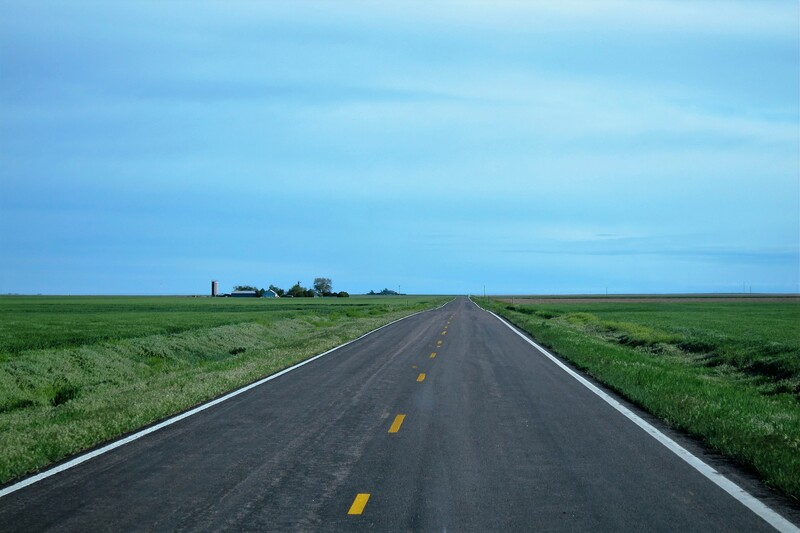 Back underway, the miles rolled by as we continued east through America’s Heartland making considerable progress toward the right coast. At 1130, we crossed the Kansas border and entered the Central Time Zone which actually makes it 1230…it’s a bit frustrating losing an hour of our travel day when we are trying to make tracks toward home!?!? The prairielands gave way to agricultural areas with the occasional oil well sprouting about. 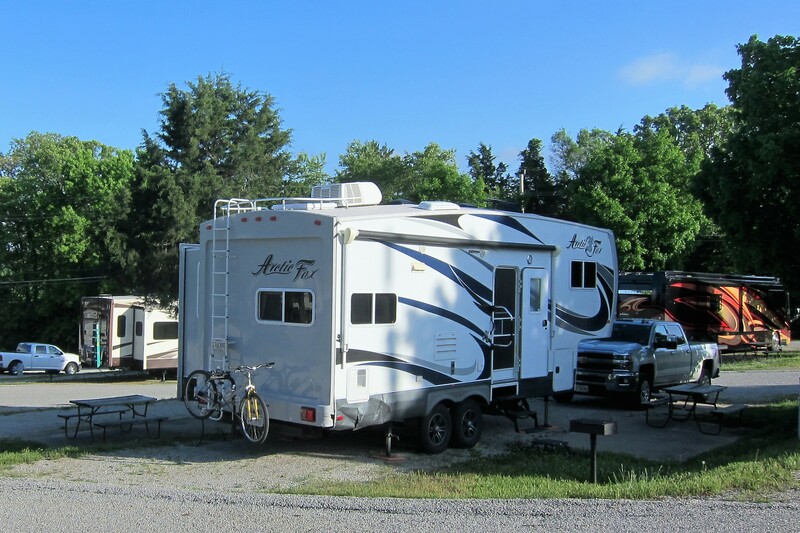 At 1530, we were getting tired so Kit brought up the All Stays App and found us a nice lakeside campground within a Kansas State Park near the town of Meade. 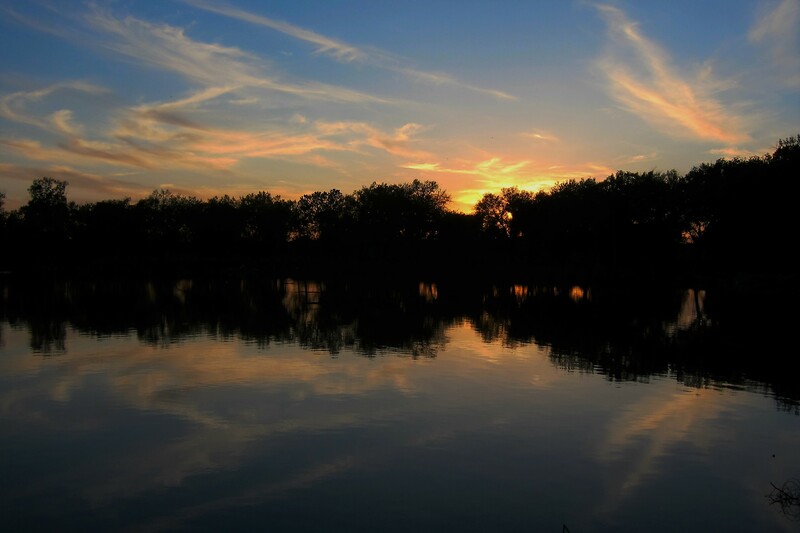 After setting up camp and enjoying a great meal, Kit and I relaxed lakeside with some mature beverages and enjoyed the sights and sounds of the local critters flitting about as the sun set on another wonderful day. Tuesday, April 26, 2016-Meade State Park: Well, Kit and I decided over breakfast this morning to stay at this beautiful state park for another evening. So, not wanting to disconnect the truck to make the two mile trip back to the ranger’s station, I un-racked my bike. It was a nice ride along a paved road that led most of the way around this manmade lake. In talking to the ranger, I learned that the lake was sustained by a small spring for many years until the spring dried up. 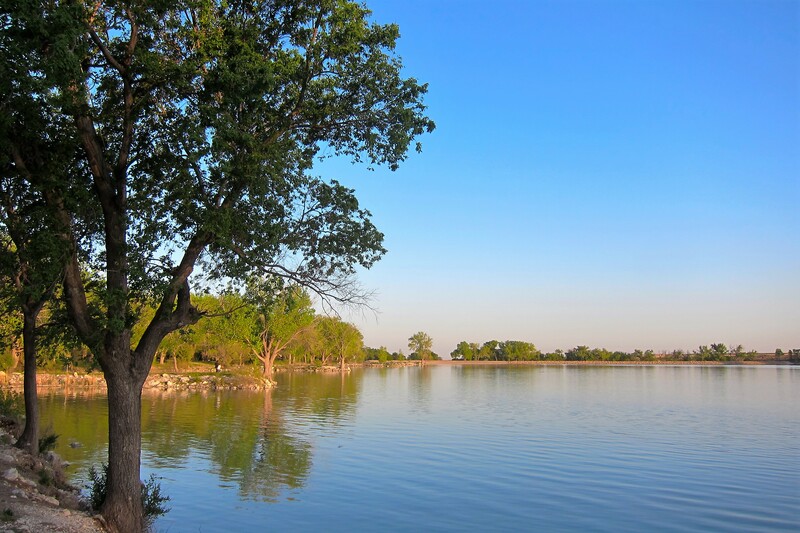 So the state really only had two choices: let nature control the lake level and deal with fishing piers, beaches and campsites that are far from the water, or, augment the natural rainfall with a dug well…they chose the latter. And so far, it has proven to be the correct choice! Kit and I enjoyed a thoroughly relaxing time here, but if we are ever going to get back home to Maine we need to keep moving along, so tomorrow we once again hit the road. 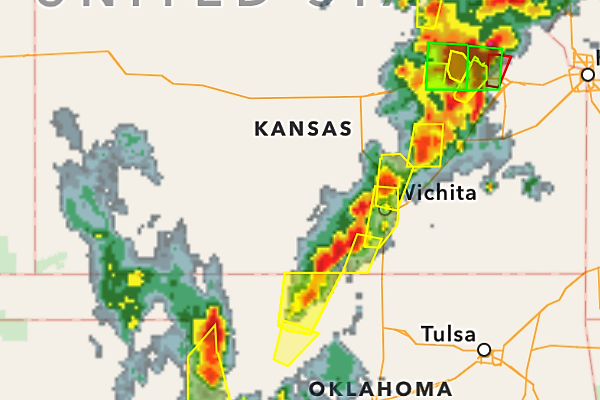 Wednesday, April 27, 2016: Well, last night was interesting…a spring storm came rolling in from the west with rain, hail, thunder, highlighting and wind! Fortunately, no damage but one crazy thrill ride in a camper without the levelers deployed sitting along an exposed lakefront! Underway at 0854 we wound our way through a bunch of backroads until intersecting US-160 where we turned toward the east. The view out the front window this morning looks very similar to the view yesterday morning…it is however, a different photo taken a few hundred miles to the east! 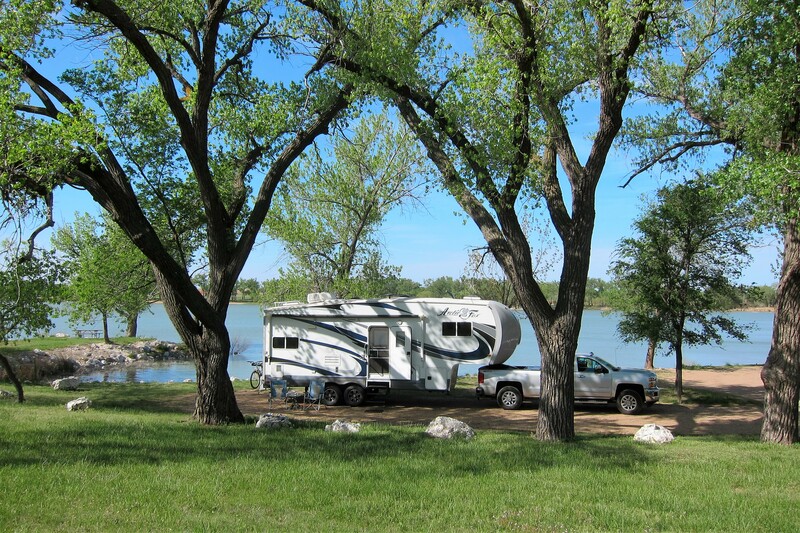 The day was spent racking up miles, with brief stops for fuel, food, comfort or to stretch our legs…one benefit of traveling in an RV, is that we can stop most anywhere for a break! No looking for a restaurant or rest area. Our only requirement is for fuel for the 36-gallon tank, which typically occurs every day and a half during a session where we are transiting cross country. Just outside Wichita, Kansas Kit found another interesting camping opportunity on the All Stays App which took us through the Kansas countryside and down a few dirt farm roads. Then around 1600 Kit and I enjoyed seeing this dam site! Yep, another nice Corps of Engineers (COE) campground with very few campers about, in fact there weren’t any ranger’s or host evident either. So Kit and I picked a nice site and self-registered by placing our $10.00 in a registration envelope and sliding it into the Iron Ranger. So, what’s an Iron Ranger you ask? Well, it looks kinda like this! 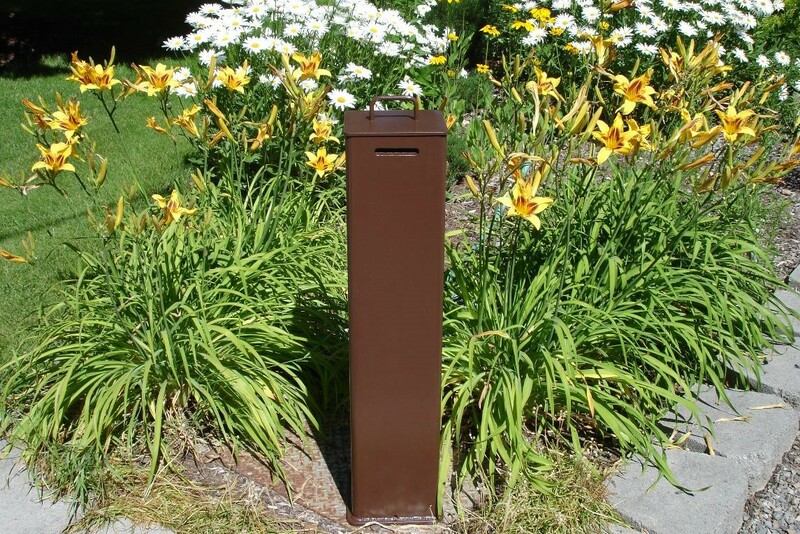 More and more government managed campgrounds are using these low cost options. However, if needed a human ranger is just a phone call away! 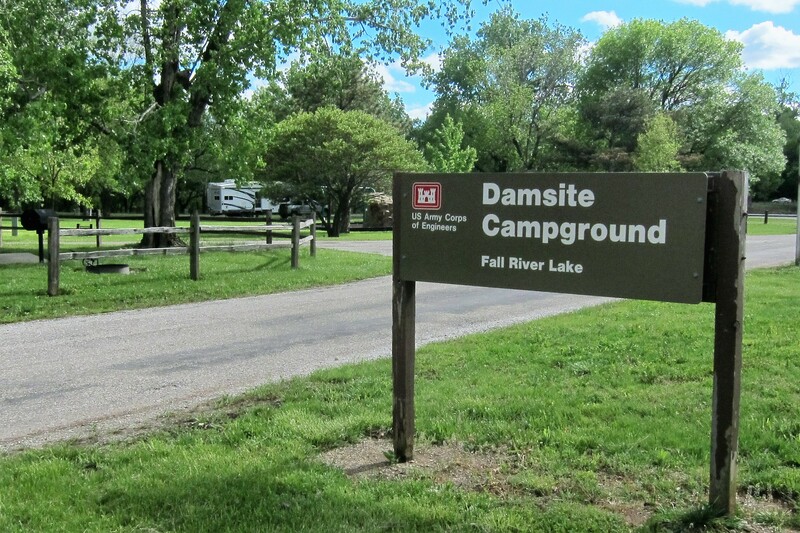 As you can imagine most COE Campgrounds are located on a river and close to a flood control or hydro dam…Damsite was no exception. 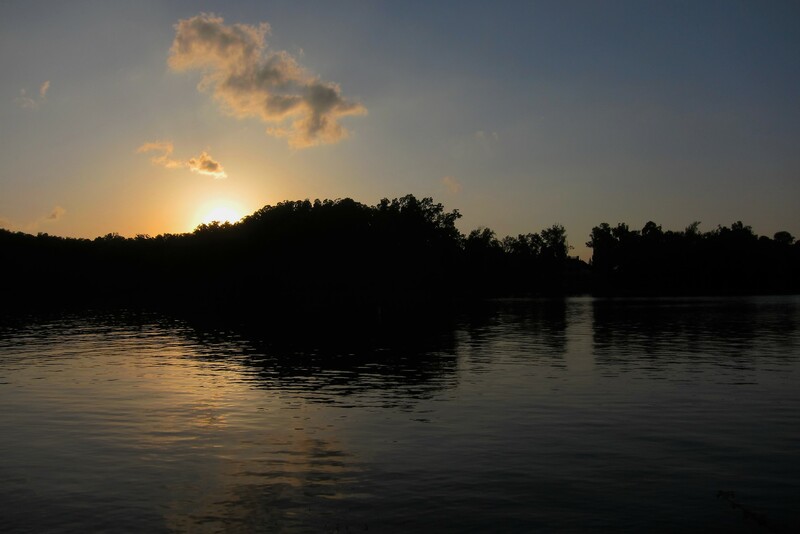 It not only provided excellent camping opportunities, but boating, fishing and other related outdoor activities as well. Following dinner and as night fell, I walked up the side of the earthen dam to view the lake and snap a few photos of the sunset. 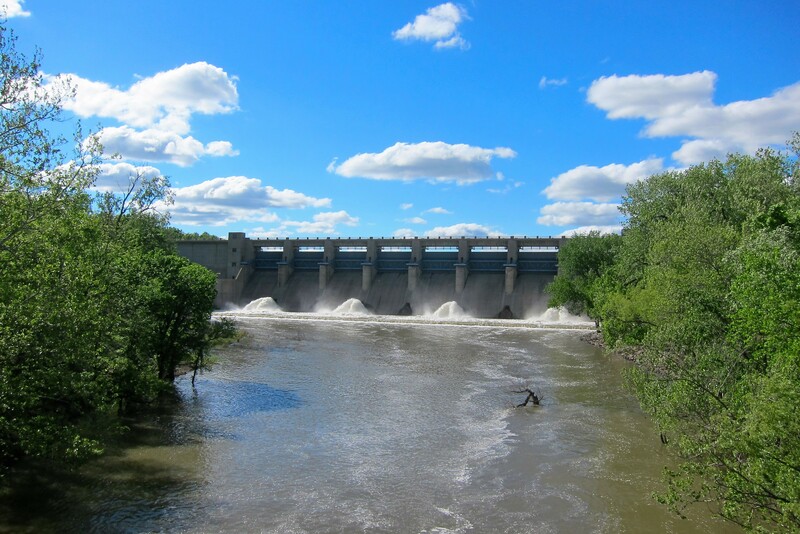 Could stay here a few days, but we must continue our journey toward the coast, so after taking care of a few pre-underway items we settled in for the evening listening to the rush of water from the spillways just a few hundred feet away. Thursday, April 28, 2016: Up, breakfast and on the road by 1000 under sunny skies and a temperature of 55 degrees. Drove back down to US-160 and turned toward the east. 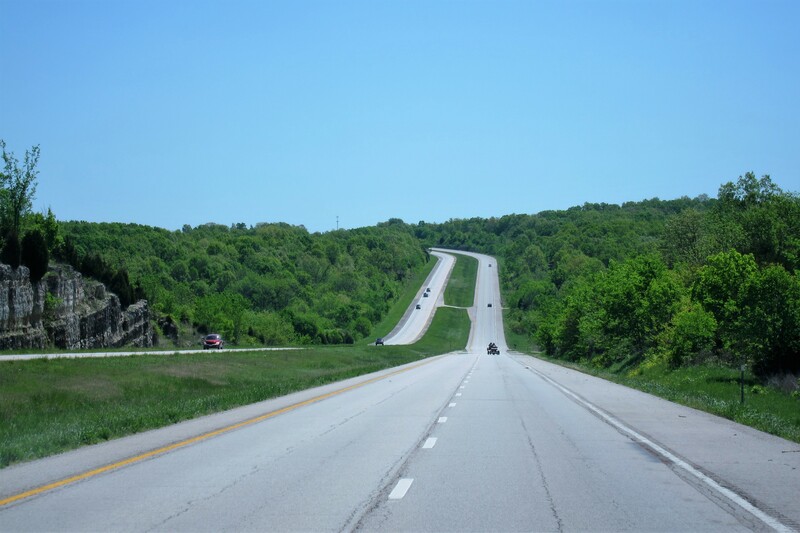 By noon we crossed into the state of Missouri and jumped on US-171 which would bring us to Interstate 44. 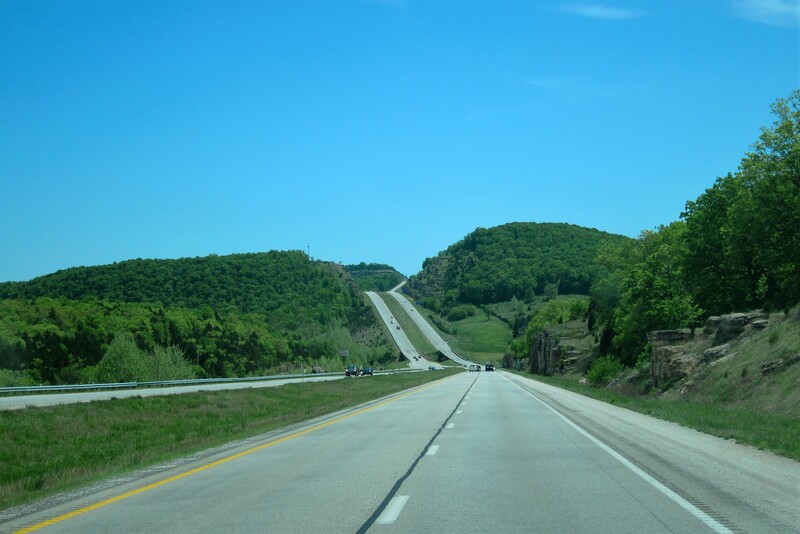 Continuing east, Kit was getting excited to finally reach a destination that was on her personal Bucket List…Branson! 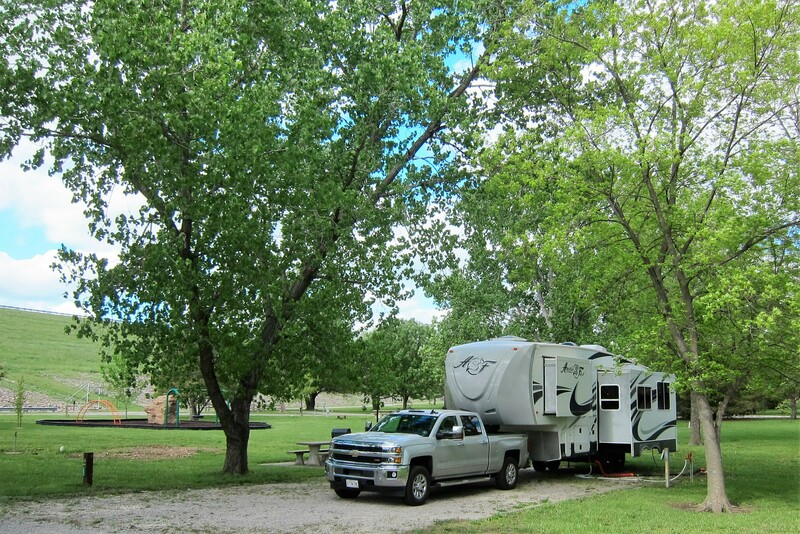 Arriving in town at 1400, we found our way to a nice commercial campground that had come highly recommended, the appropriately named “America’s Best Campground”! Paying for a three-night stay, Kit and I set up on one of their nice level full hookup sites for the duration. We spent the rest of the afternoon and early evening walking about the campground, doing some laundry, researching things to do in nearby Branson and otherwise just goofing off. Friday, April 29th and Sunday, April 30th, 2016-Branson, Missouri: Kit and I were pretty well armed with information pertaining to sights to see in Branson, however before we left the campground, we walked up to the office to grab some brochures and ask about any inside information on the best way to get the maximum enjoyment during our two day stay in town. Encountering a nice young man who had grown up in the area, we peppered him with a number of questions and received a lot of great advice. Since it was raining and it was slow in the office, we hung around and schmoozed a bit learning a great deal about Matthew and his upbringing. As we said our goodbyes, he asked which music show we were planning on seeing while in town, and before I could even consider the options Kit blurted out “anything with an Osmond performing in it”! 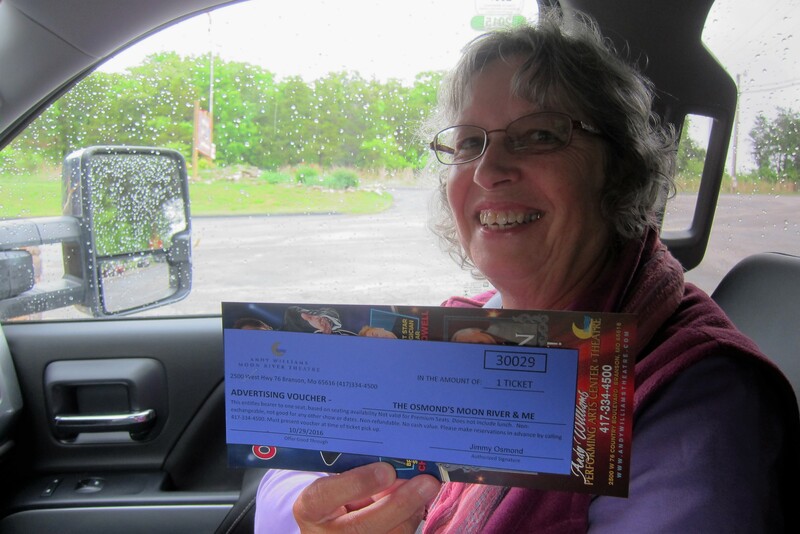 Matt then thumbed through a small folder and presented us with two comp tickets to see Jimmy Osmond! Kit was ecstatic! Since a few years ago, she enjoyed Donnie and Marie in Vegas, at this rate she may end up seeing all the Osmond family perform…one at a time! Since Matt said that this time of year the reserved seating is assigned “first come-first served”, we made a beeline for the Andy Williams Theater to obtain our tickets. Good Karma continued to shine down upon us as we were able to grab two seats in row five-center for tomorrow afternoon! 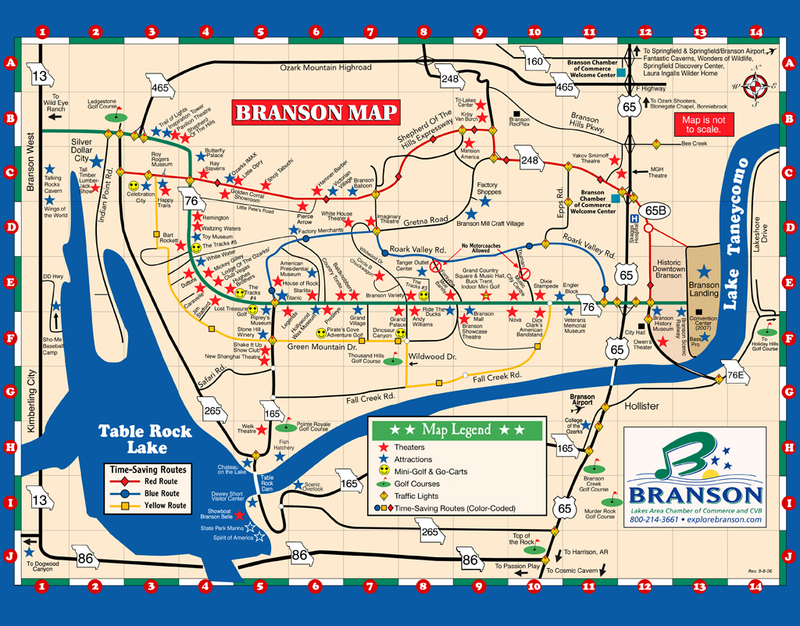 With tomorrow all set, we decided to investigate the town of Branson that we have heard so much about over the years. As you can see from the map above, this whole place is devoted to live music…the blue stars on the map denote theaters for live performances. As the story goes, some early Country and Western singers were tired of being on the road and decided to build venues in Branson and let the public come to them. Well, the concept was a hit and the town quickly grew into the live music capital of the world. 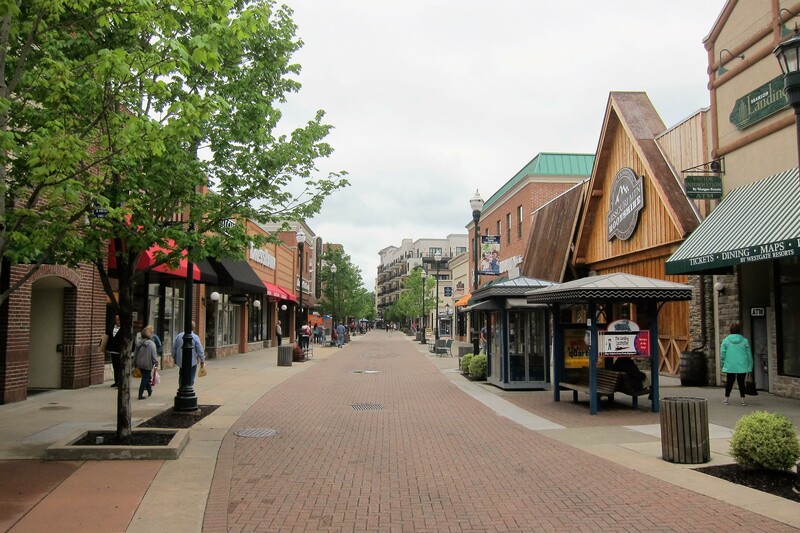 Along the shores of Lake Taneycomo lies a mega shopping complex called “Branson Landing”. It contains every major retail establishment know to woman along with specialty shops, restaurants and taverns. Of all the areas in Branson that one could spend time, Kit and I liked the old historic downtown the best. True it lacks the glitz of the music strip or Branson Landing, but the collection of old antique and craft shops, alongside hardware and variety stores was the perfect mix for us. And as we were to find out, it also had the best restaurants. Canvasing the locals, we were advised to have lunch at the Farmhouse where the special of the day was an “all you can eat” catfish dinner! 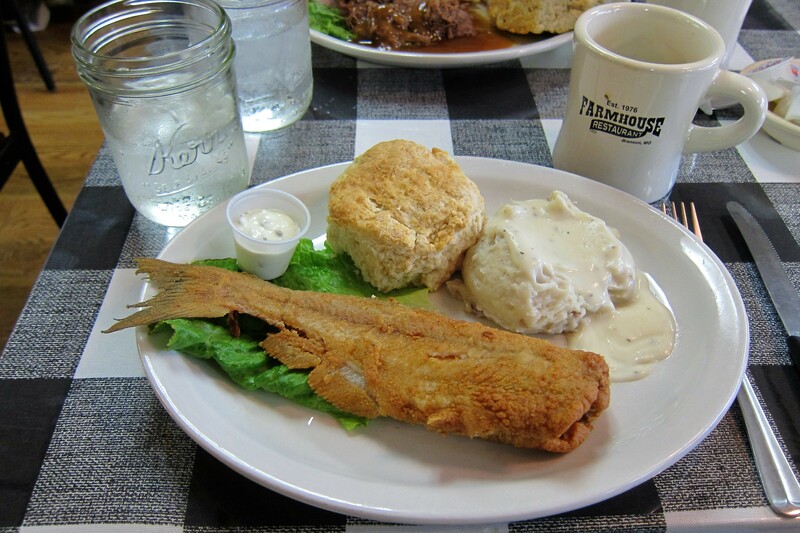 Now, I have worked and lived in the south and have enjoyed a ton of fried catfish, but it was an unusually large filet dipped in batter and fried. This meal consisted of fish that looked similar to brook trout! However, it was definitely catfish and tasted very good! 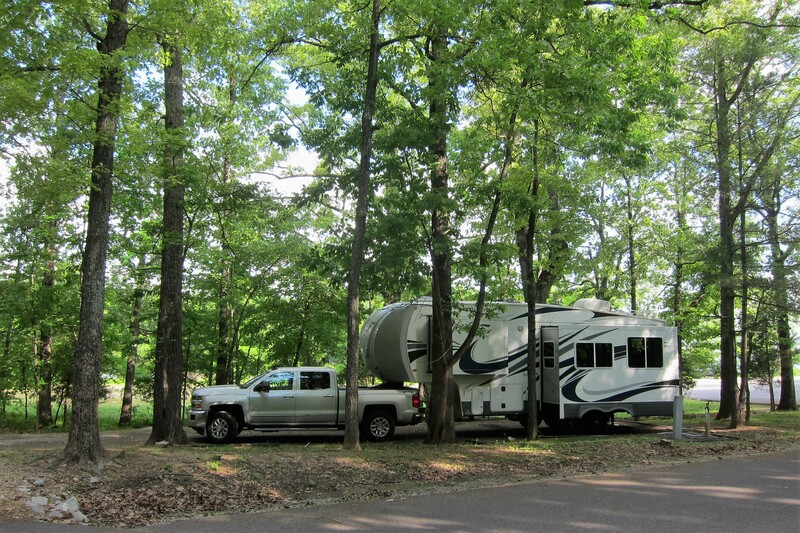 After some more poking around Historic Branson, we made our way back to the campground. The second full day in town Kit and I lazed around the camper and then headed into town for our show. 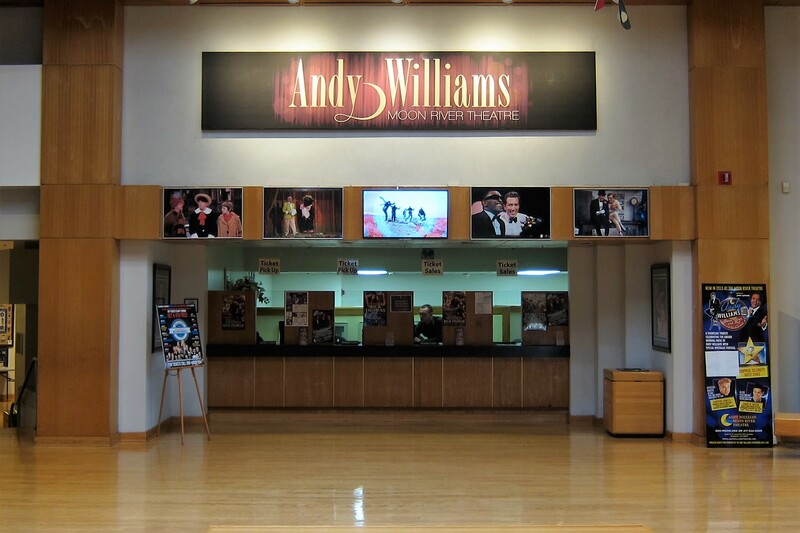 Jimmy Osmond was to perform in the Moon River Theater that he had acquired from Mister Andy Williams. In the lobby, we enjoyed the many photos and artifacts pertaining to the career of Andy and his relationship with the Osmond family. There was a photo of young Jimmy appearing on The Andy Williams showing the mid 1950’s. And here he is today in the middle of what turned out to be a fantastic performance and a heartfelt tribute to his mentor and friend, Andy Williams. Following the show, Jimmy came out to greet the fans and pose for photos…a thoughtful but unusual gesture in this era of isolated public figures. 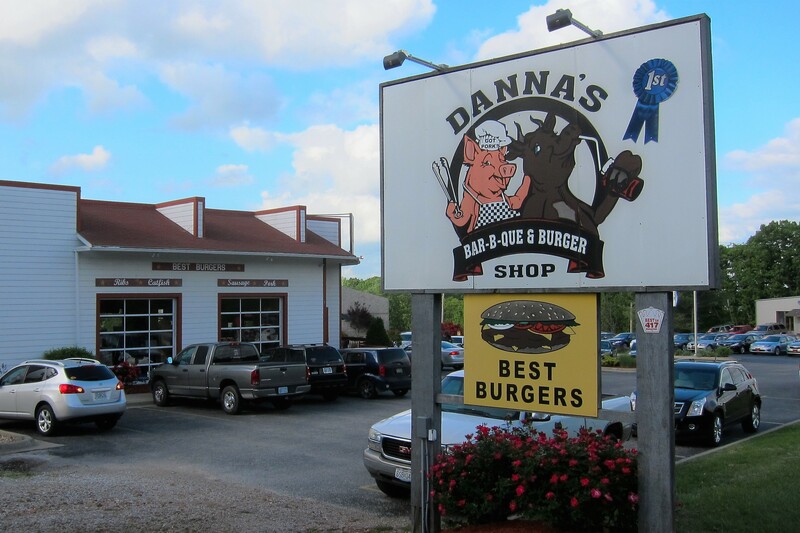 After a twenty-minute ride into the countryside we came to a small town and found Danna’s, a Barbeque place we had heard about yesterday. 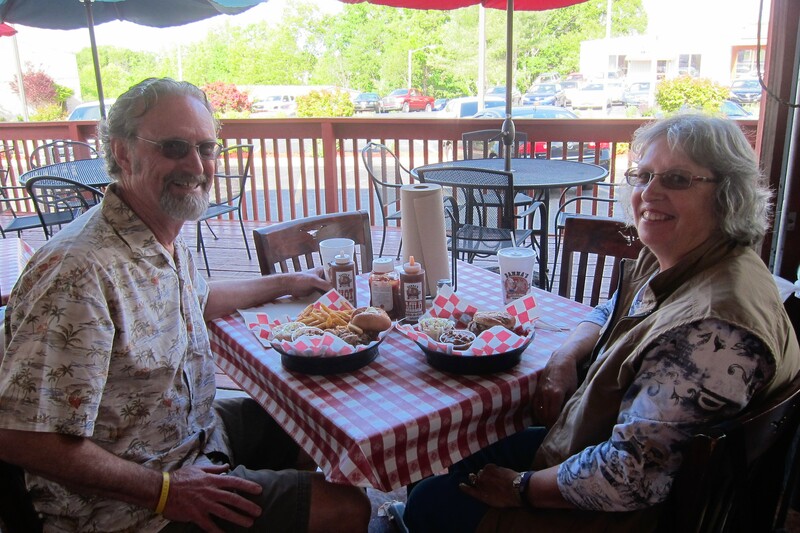 The effort was well worth it as we both enjoyed some excellent barbeque on their open air deck. After which we made our way back to the camper to relax and prepare for our departure in the morning. 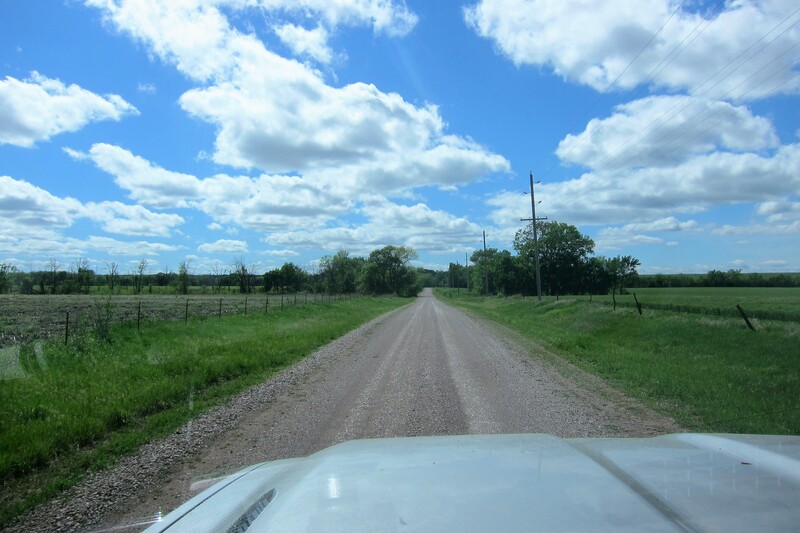 Sunday, May 1, 2016: Up and on the road at 1000 hours under clear and sunny skies. Making our way north to intersect with US-60 which we rode toward the east. A nice day rolling through the Missouri countryside with occasional stops for food, fuel or just to stretch our legs a bit. 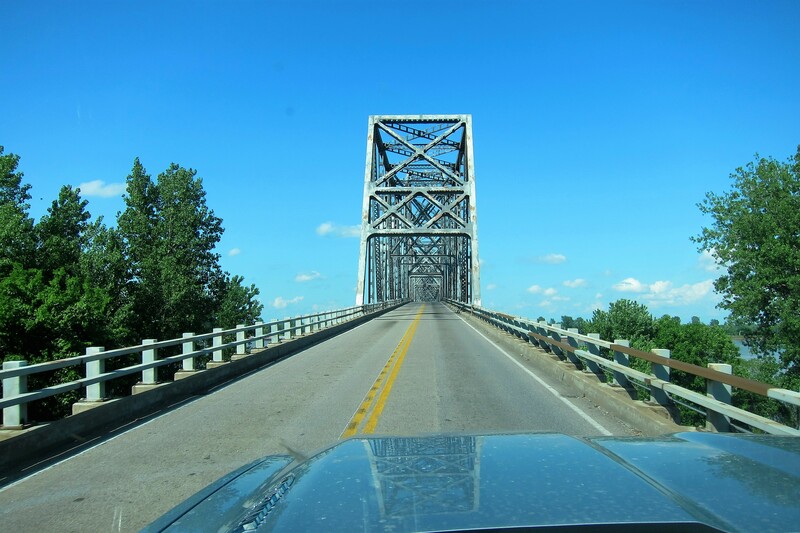 By 1615 we came to a bridge spanning the mighty Mississippi River. Two minutes later Kit and I were crossing the Ohio River and entering into the state of Kentucky. Now this has some special significance to Kit and I as it marks the 48th state we have RV’d in over the past 50 years! Two hours later we were crossing the Tennessee River and decided to stop for the evening at another nice COE facility called Canal Campground. After a great meal and some walking about time, Kit and I settled in for the evening. 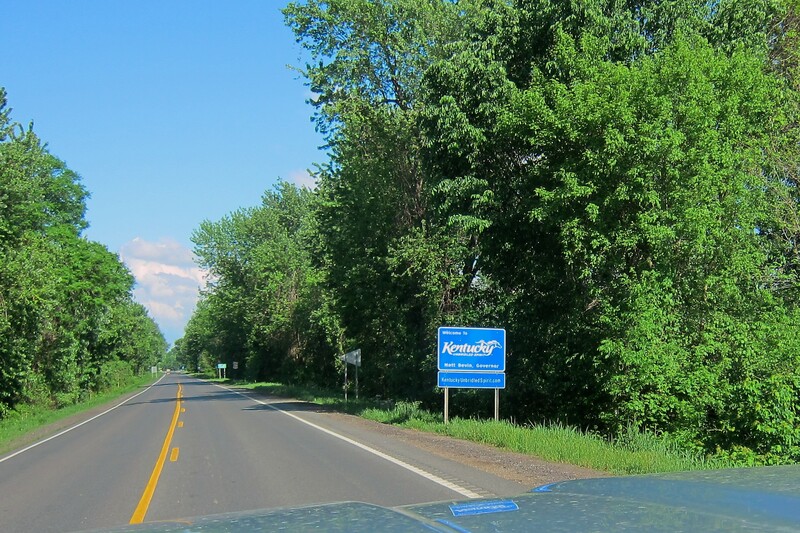 Monday, May 2, 2016-Grand Rapids, Kentucky: Well, as so often happens when we find a nice campground while transiting an area, we decided to extend our stay an additional night. While talking to the ranger I discovered this area was built and established under the auspices of the Tennessee Valley Authority (TVA), a public works project during the great depression to assist farmers and other folks that had been severely impacted by the economic downturn. Its main focus was flood control, developing sustainable farming practices, creating recreational opportunities, and providing public works jobs for the chronically unemployed of the region. Kit and I spent most of the day just cleaning up the trailer and truck, goofing off around camp and enjoying the many nature trails in the park. As the sun set into the western sky, we sat outside and discussed plans for the next few days’ travel as the sun set into the western sky. So, where will we end up tomorrow? Not sure yet, guess we will find out together…stay tuned! A quick personal note, last summer Kit arraigned for a professional portrait taken of our family to celebrate our 50th wedding anniversary. Well, the studio that did the work has asked permission to use our photo in an advertisement in the Maine State Music Theaters (MSMT) programs this season. What an honor, of course we said yes! Not only do we want to promote a great local family business but the MSMT is a wonderful cultural institution in our small town. Kit’s Bit’s: As we roll along the highways, heading east, all the beautiful green trees and budding trees, bushes and flowers are so pretty! While I love touring out west and seeing family and friends, being a Minnesota girl, I truly love the greener parts of the country. 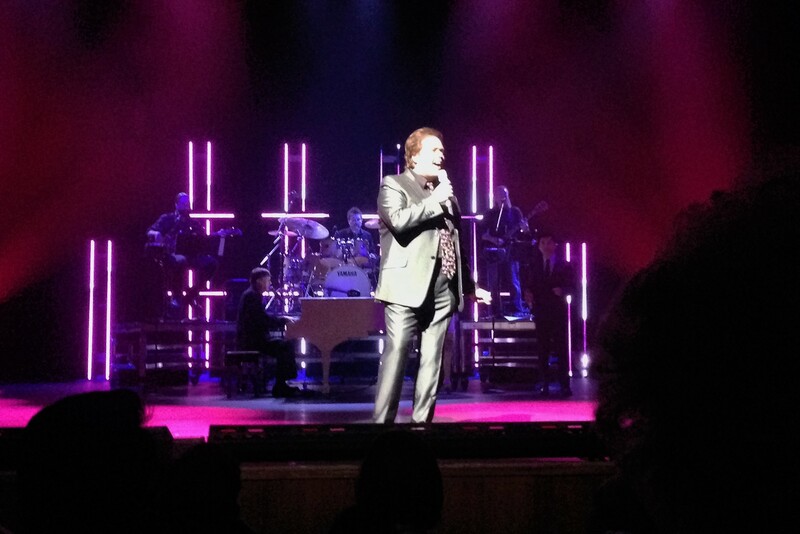 Loved seeing the Jimmy Osmond show! And, loved Branson, although, I was surprised it was so hilly. Not the easiest place to walk for hours on end. Very glad I was able to finally see it, though. We missed Silver Dollar City, maybe we’ll make that next time through. ENJOYED THIS ADVENTURE AS MY GREAT, GREAT, UNCLE “CHETTI” WAS BORN IN PRITTCHETT. THE POPULATION BACK THEN WAS ONLY 40. I’LL BET YOU’RE AMAZED AT THIS PICE OF HISTORIC INFO. HURRY HOME WE’RE GETTING HUNGRY!! Enjoyed your latest adventure journal, great photography, Bill! 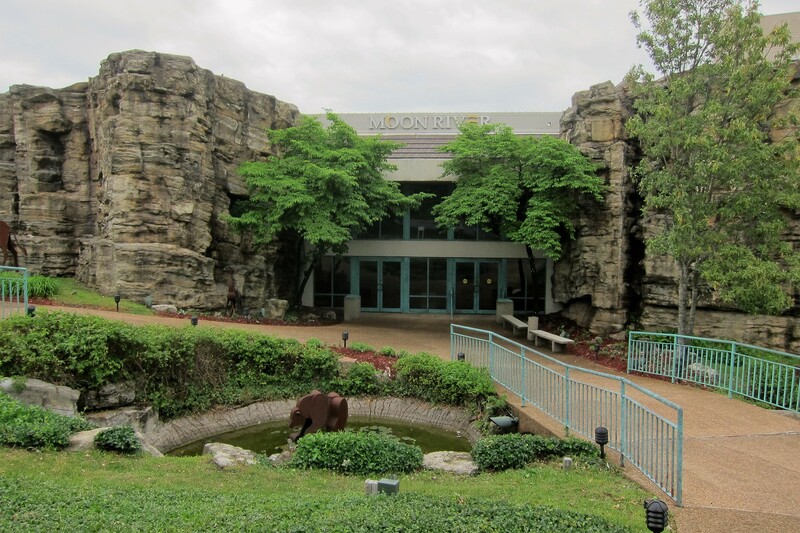 Branson is one of our most favorite places to go…actually we have been there just 2 times, but loved it. We stayed at the Peapatch RV park…a smaller park, but very close to the music venues…we, too, got to see some Osmonds…2 or 3 were performing on our second trip through Branson.Nice town, great food. Roger’s squadron (VW-1) had it’s reunion there earlier in May…but we did not get there…headed north and west again. Keep on truckin’, you’re nearly back home again! Great narrative…know you loved this trip! I LOVED that pic of the Rocky Mtns..what a beautiful contrast in colors..would make a beautiful oil painting as would so many of your nature shots… I am surprised at how green Kansas State Park is..looks like a campground in Maine. I’ve never been to Branson either so thoroughly enjoyed seeing it thru your eyes. Another place on my bucket list! What a charming and unique theater Moon River Theater is! 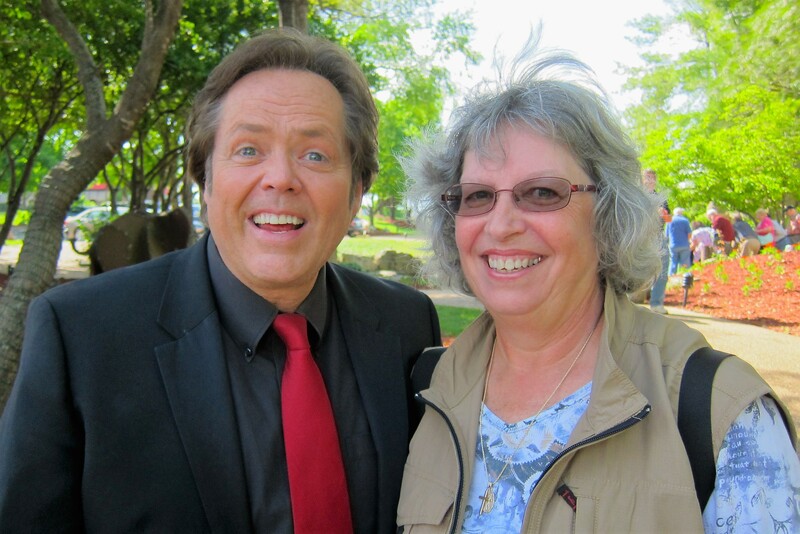 So impressed that Jimmy Osmond took time to do that…Kathy has the biggest smile!! …Congratulations on 48 states in 50 years (I thought that Kentucky was the last one)..and Congratulations on the VERY WELL DESERVED honor of being chosen to have your family pic in the MSMT program ….what a proud moment that must be for your entire family! Now that is a family portrait that would look great on a wall if it isn’t there already! ……It was such a wonderful surprise seeing you two last night…so glad you are home safely….